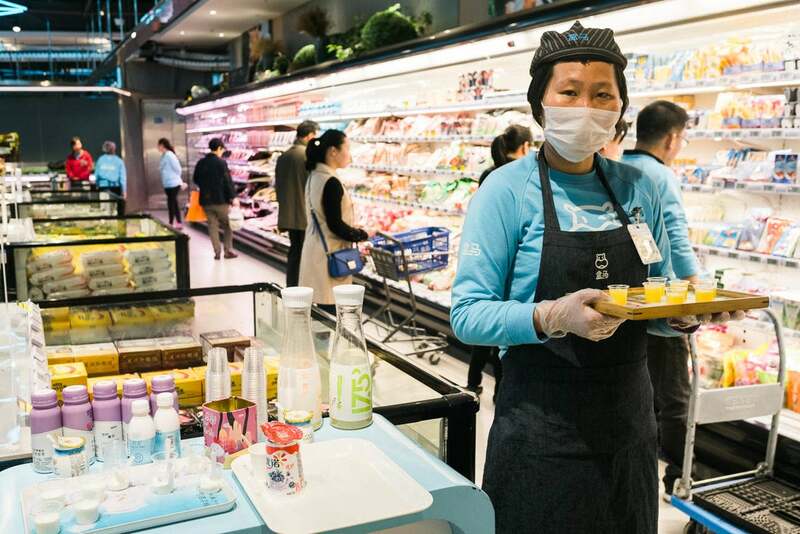 At Hema Xiansheng, Alibaba's futuristic supermarket, you can even pay with facial recognition. With a valuation over $500 billion, Chinese tech giant Alibaba is second only to Amazon in e-commerce. But it's going after the offline world to keep growing. 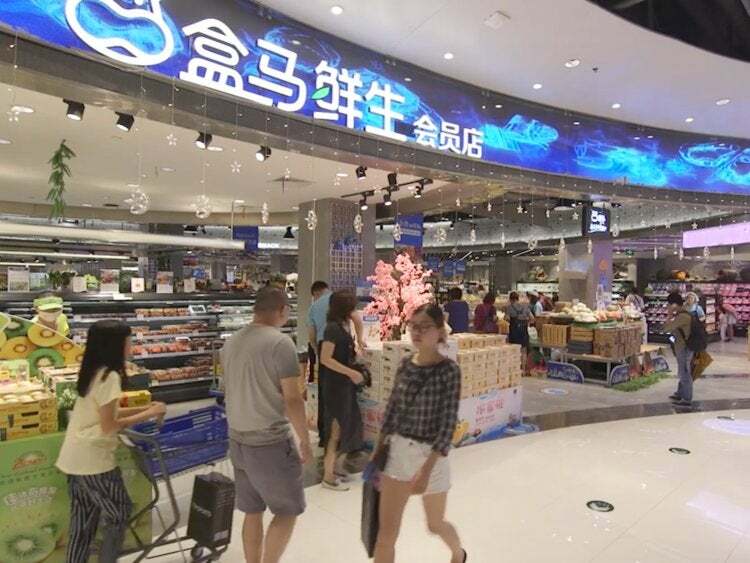 Long before Amazon purchased Whole Foods for $13.7 billion, Alibaba was forging into physical retail with investments in supermarket SunArt, department store operator InTime, electronics seller Suning, and furniture store EasyHome, among others. All in all, Alibaba has spent $10 billion on traditional retailers since 2016. 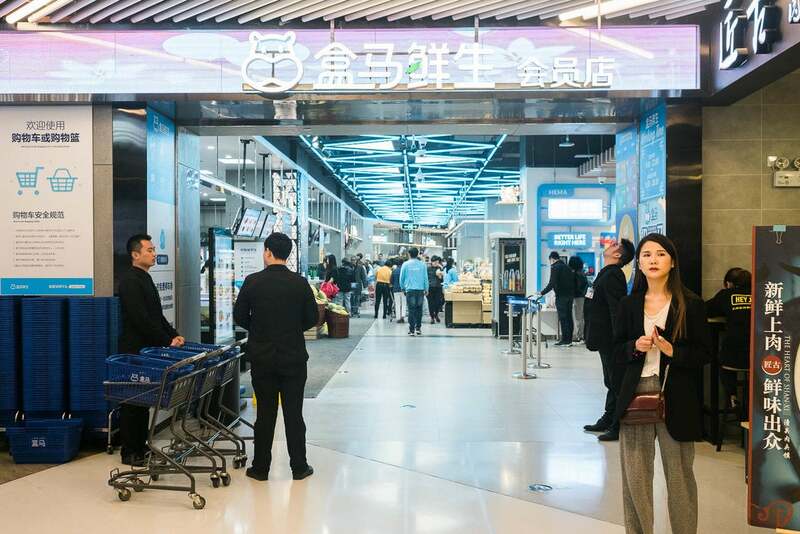 The investments have aimed to help the company develop its "New Retail" concept, a term coined by Alibaba founder Jack Ma to mean the fusion of physical retail and e-commerce. At its core, it's about making it insanely convenient to buy what you need or want in whatever way is the most convenient to you — whether at the store, online, delivered to your home, picked up at a nearby store location. 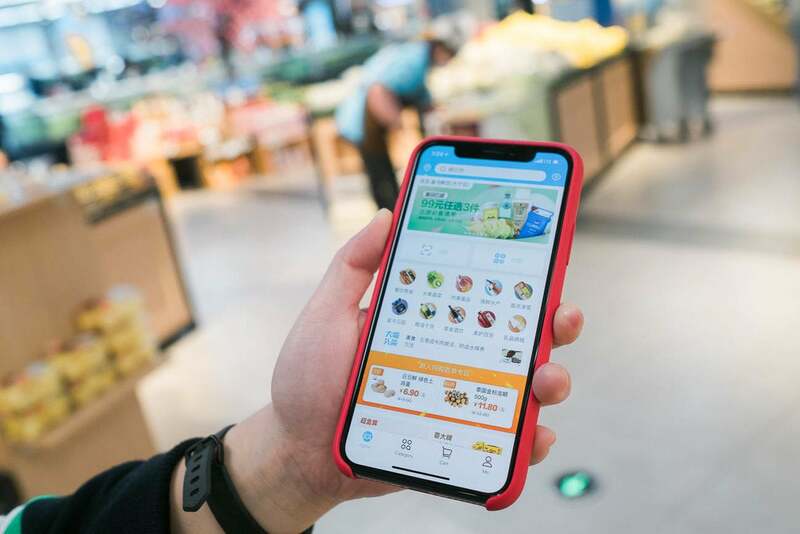 By integrating online and offline, Alibaba thinks it can radically change customers' shopping experiences for the better while boosting business for its partners. "That means that the whole inventory and supply chain is one solution for whatever your needs are. 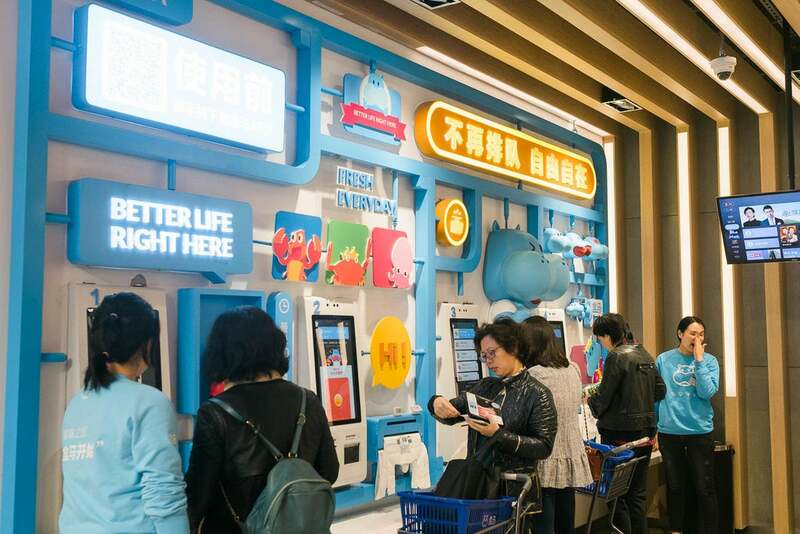 No matter whether [your purchases] are generated online or offline, it will be fulfilled in whatever is the most efficient route to you," Jet Jing, President of Tmall, Alibaba's brand-focused e-commerce platform, told Business Insider recently. 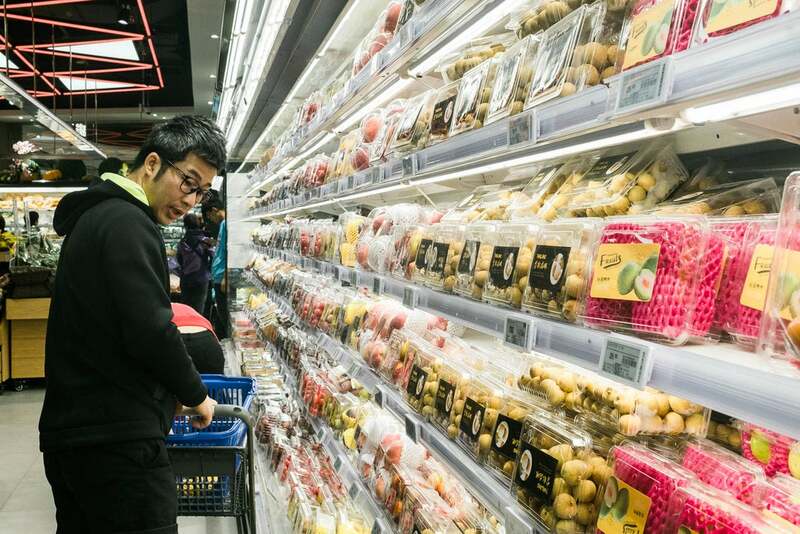 Nowhere is the "New Retail" idea more on display than in Hema Xiansheng, Alibaba's futuristic supermarket. 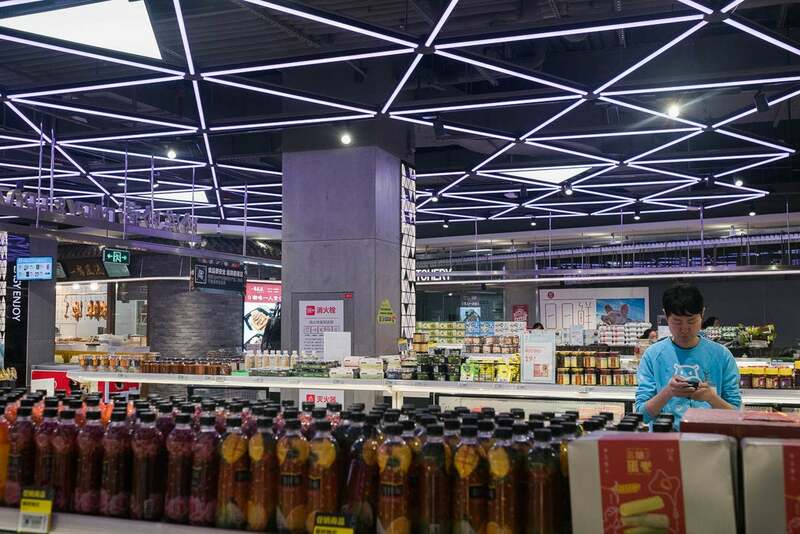 Launched in 2015, Hema has expanded to 46 stores in 13 cities in China, with plans to open up to 2,000 more branches in the next five years. 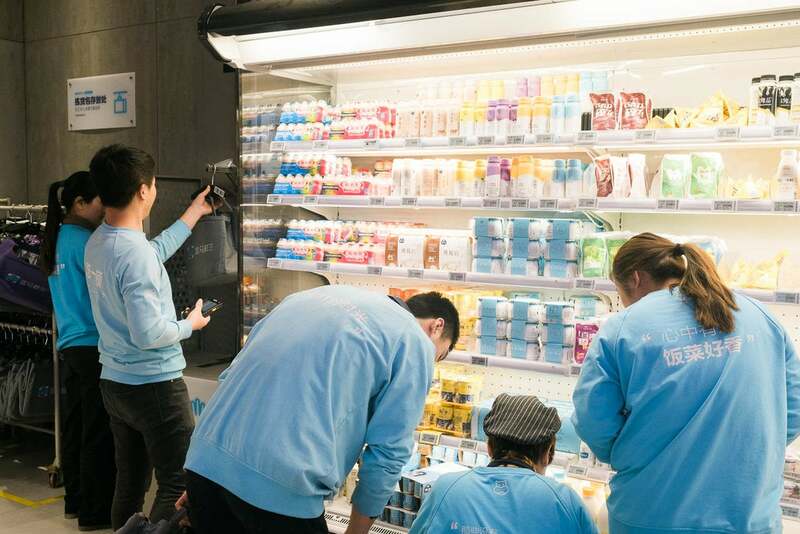 The fresh food-focused supermarket offers customers the ability to shop in-store or on its app, see the origins of the products in the store, have food delivered for free or prepared for pickup within 30 minutes, and pay with facial recognition technology. 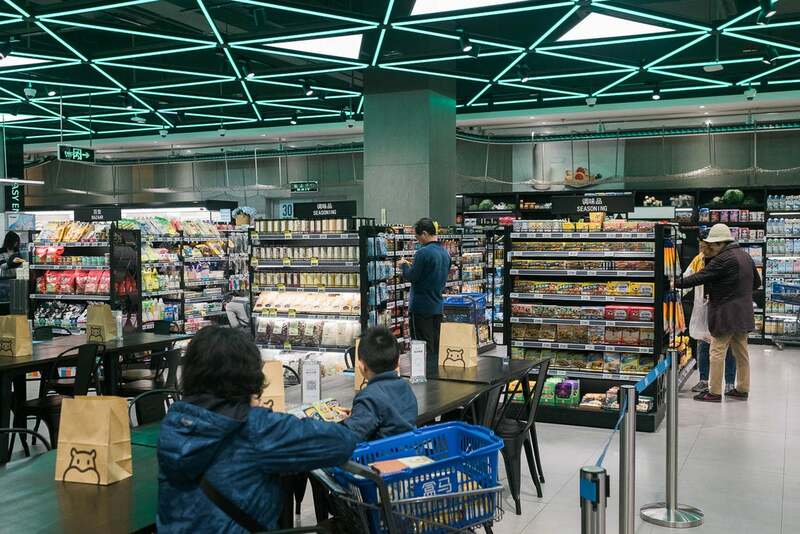 We recently visited a Hema branch in Shanghai to see what the company's vision of the future of grocery shopping. 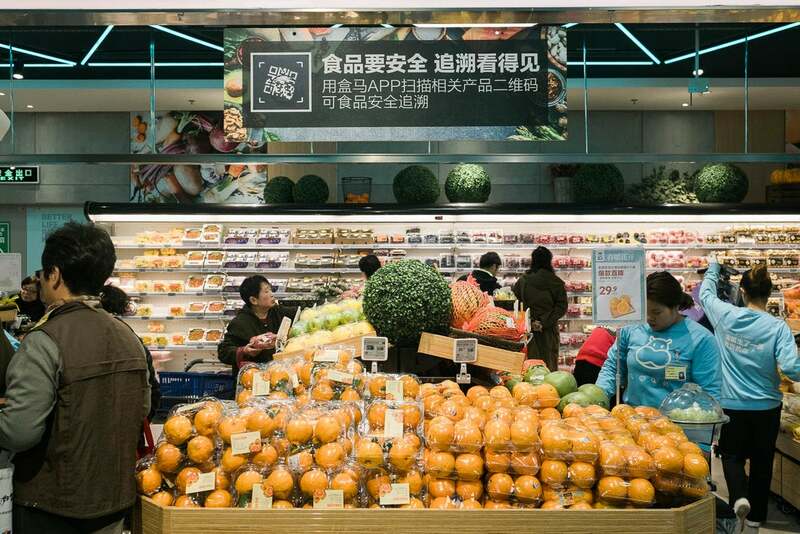 One can't help but think that Alibaba's deep integration with Hema signals how Amazon will integrate Whole Foods in the future. There are over 40 Hema Xiansheng locations in China. 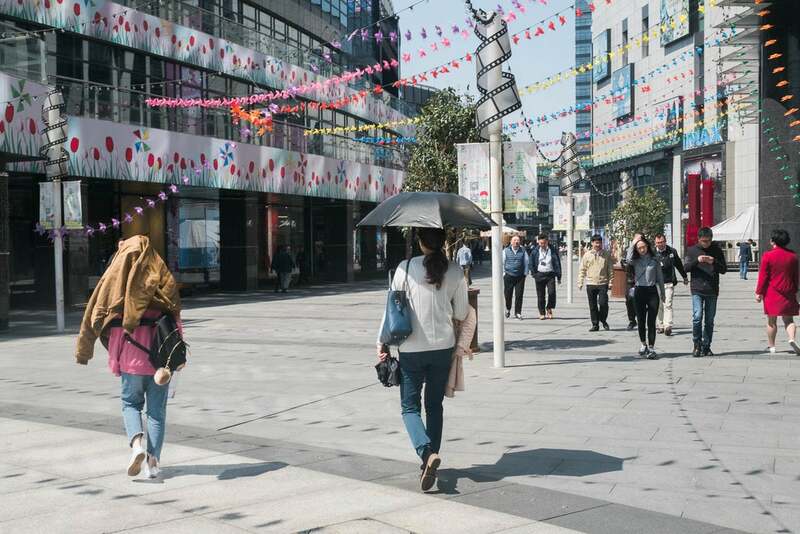 Most are located in high-end shopping malls or mixed-used developments close to where Chinese people both work and live. Core to Hema's model is that it offers free 30-minute grocery deliveries to a 3-kilometer radius. The joke used to be that Chinese people like to live near good public schools, Liyan Chen, manager of international corporate affairs at Alibaba, told Business Insider. "The joke now in China is that they want to live where the Hemas are. Because then they can get everything delivered to them really easily." 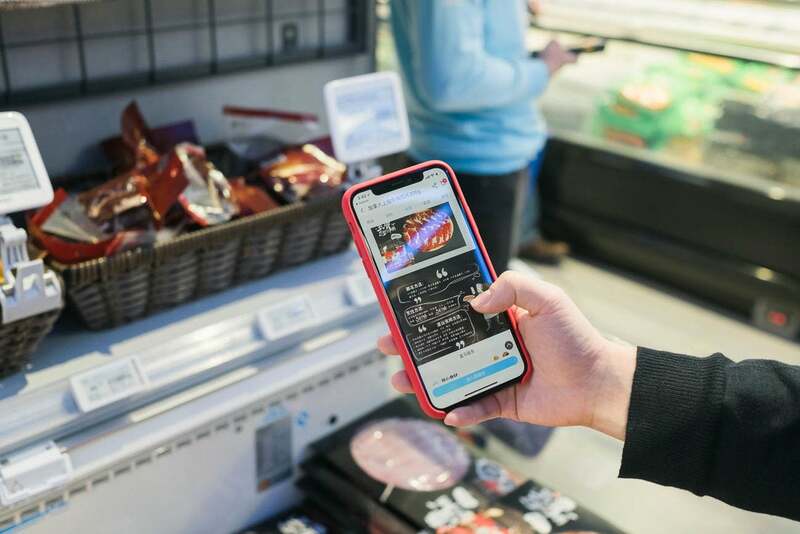 In order to shop at Hema, you have to download the app, which logs all of your purchases, saves your preferences and delivery address, and allows you to pay with Alipay, Alibaba's mobile payments provider. After shopping at Hema, you'll have a personalized product page based on your preferences and purchases. The name Hema Xiansheng means "boxed/packaged freshness and liveliness" and is also a pun in Chinese for Mr. Hippo, hence the hippo mascot. 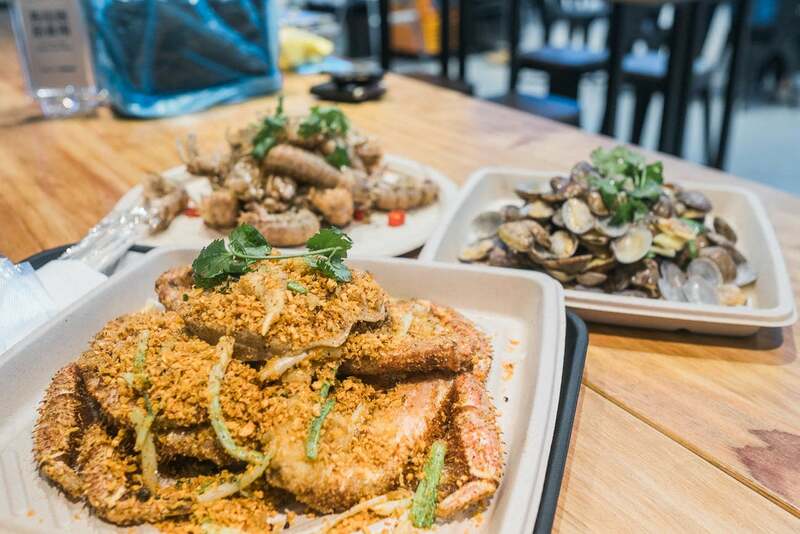 Hema's major selling point is its ultra-fresh meat, veggies, fruit, and seafood. 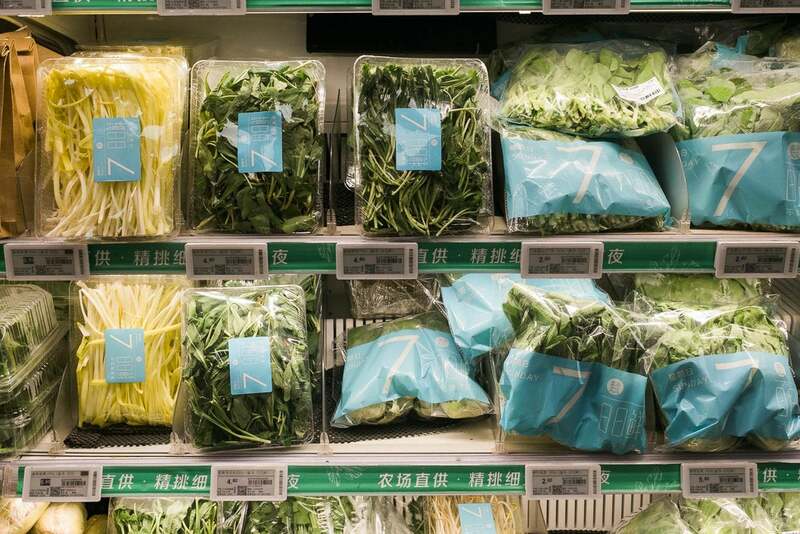 Freshness is a big deal in Chinese culture, particularly given how inconsistent it can be at other supermarkets. There are two words for freshness in Mandarin, one for "crisp" fruits and veggies, and another for freshly butchered meat and fish. There are numerous testing stations so customers can taste the freshness and sweetness of the produce in-store. 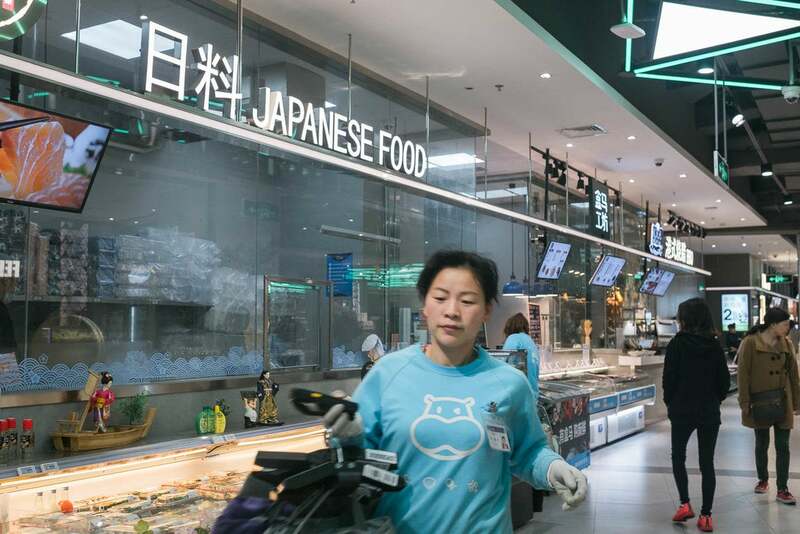 All technological innovations aside, the main draw of a Hema store is its expansive live seafood section. It's like putting a traditional seafood market in the middle of Whole Foods. Except Hema's is spotless and organized. 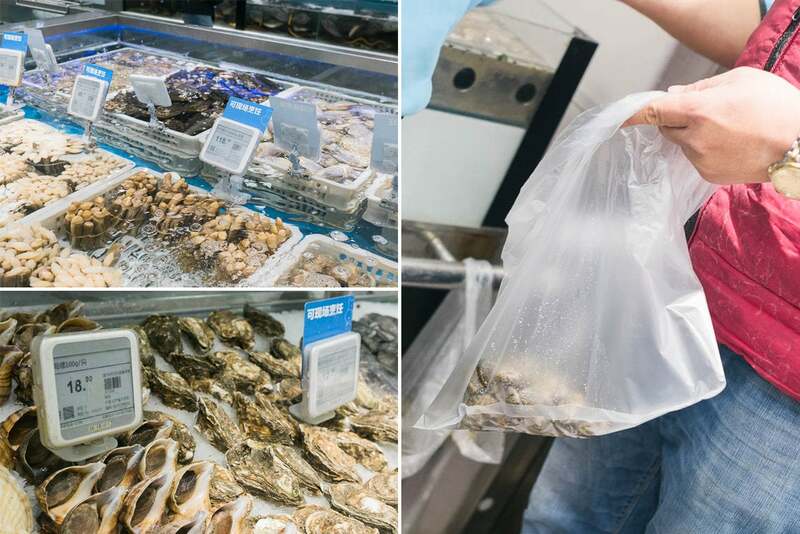 There are rows and rows of fresh, live oysters, scallops, shrimp, prawns, lobsters, and fish. While Chinese tend to like picking their own seafood, I opted to have a Hema employee help me select a mix of clams and scallops. I have no idea what kind of crab this was — maybe a Chinese hairy crab — but it looked tasty. I decided to buy that one, too. 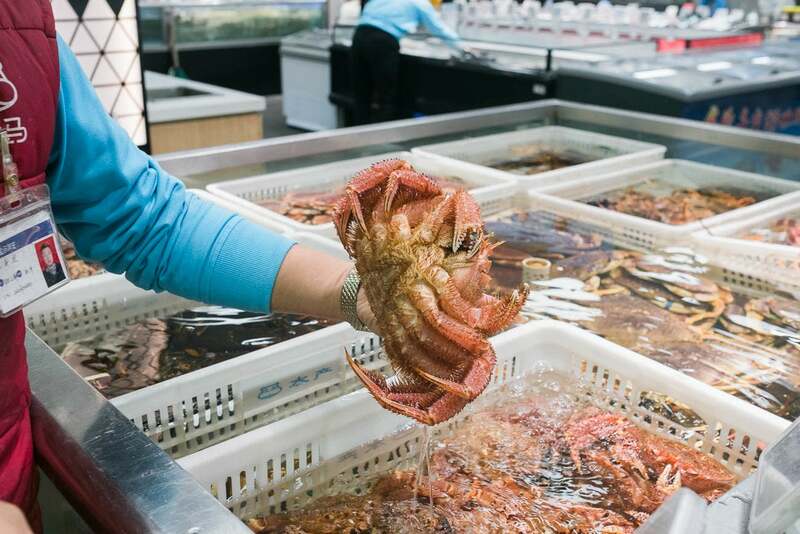 While most purchases happen through the app or through a cashier-less checkout counter, the seafood section still needs someone to weigh and price the products. But one scan of a QR code on Alipay and I was all set. 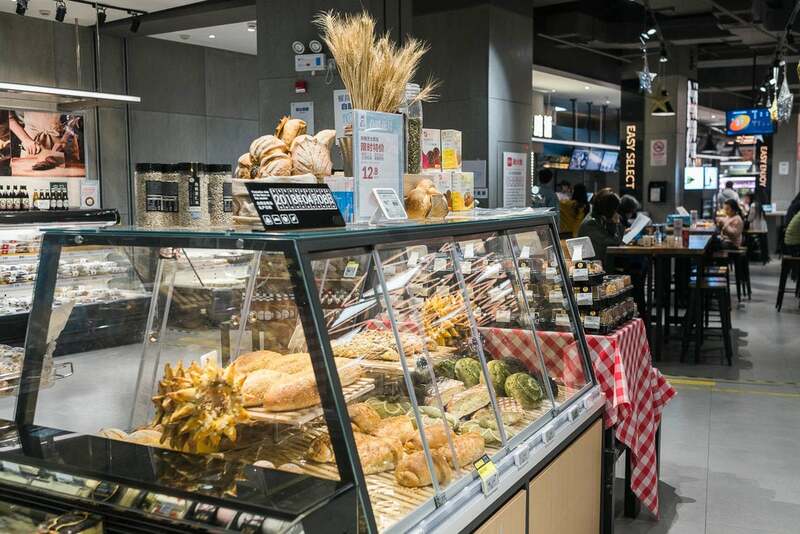 In addition to its traditional grocery items, Hema has an expansive prepared foods section. 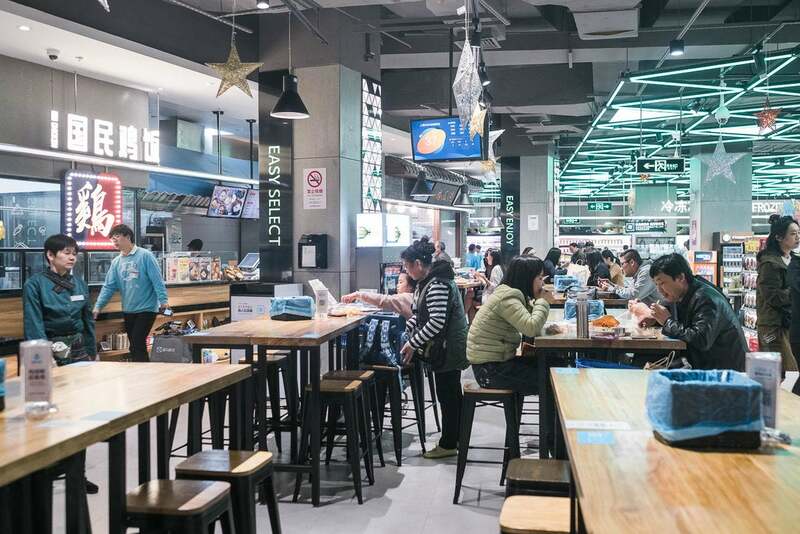 It's a little like a high-end food court, with enough space to seat 100 people. Because Hema stores are usually near office buildings, it's a very popular lunch spot. 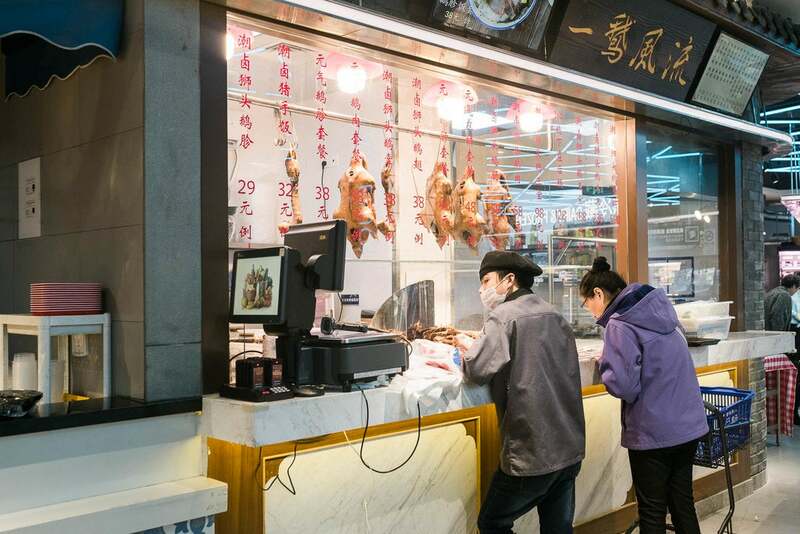 There's a Cantonese food counter that sells roast duck, pork, and other popular dishes. 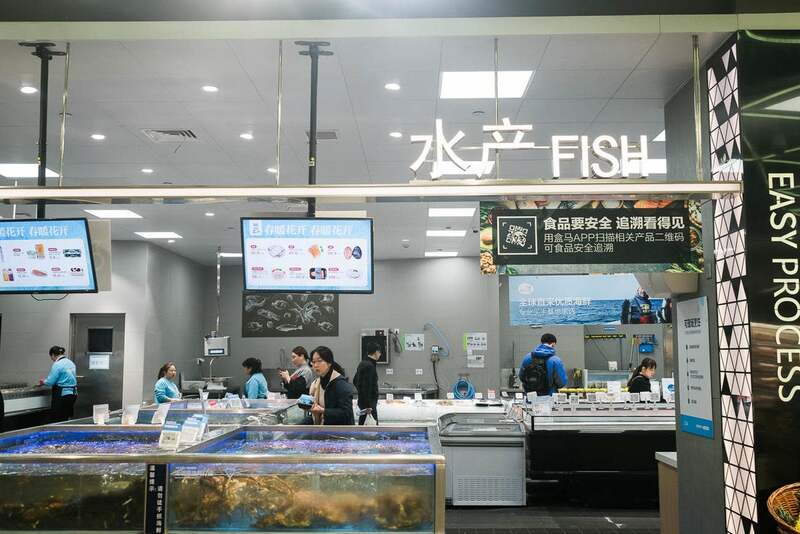 There's also a counter where you can bring your seafood after you buy it to have it cooked in a number of different styles. I decided to have the crab, scallops, shrimp, and clams that I bought cooked by Hema. While I waited for my seafood to be cooked — it takes around 20 minutes — I wandered around the store. 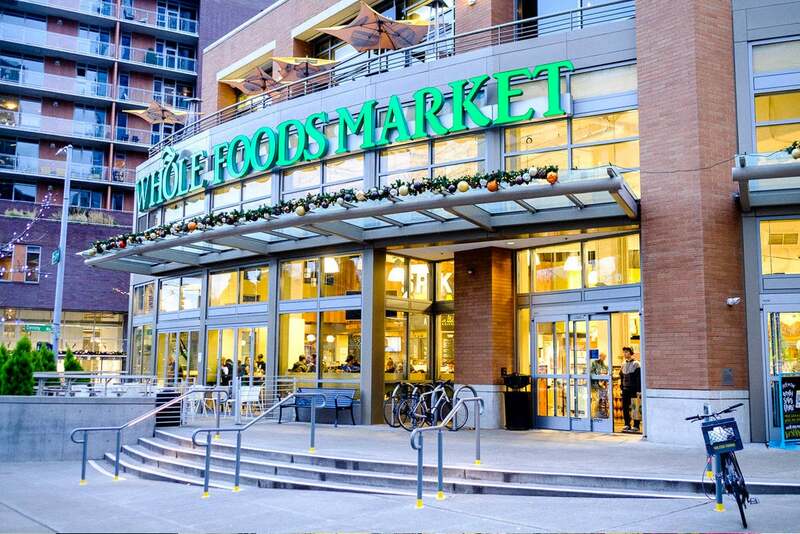 Compared to a Whole Foods in the US, it's pretty small. But it packs a ton of variety of products into the shelves. Hema can afford to have a smaller footprint. 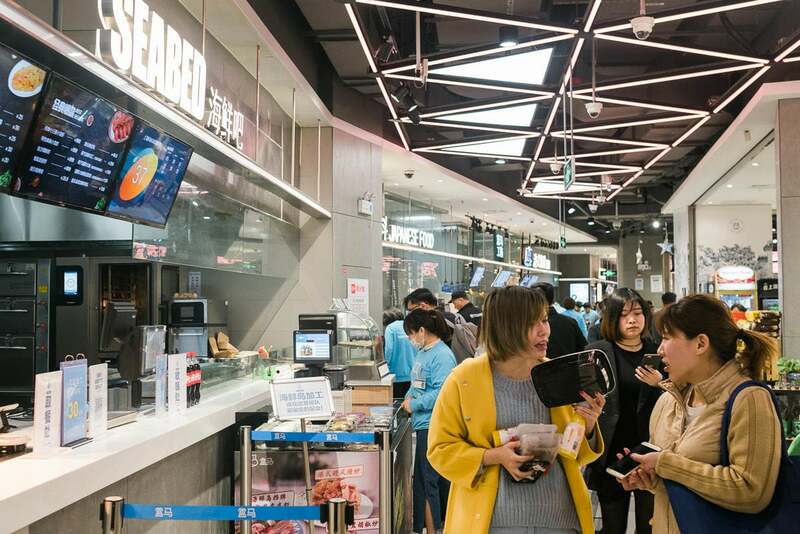 Thanks to Alibaba's deep trove of data on consumers — the company had 515 million active consumers on its platforms in 2017 — as well as the data collected by the Hema app, each Hema store is able to tailor its stock based on the spending habits of those who frequent the shop. The supermarket offers around 3,000 different products in each store, while the Hema app has over 50,000 items. Prices are synchronized between online and offline via electronic shelf labels. 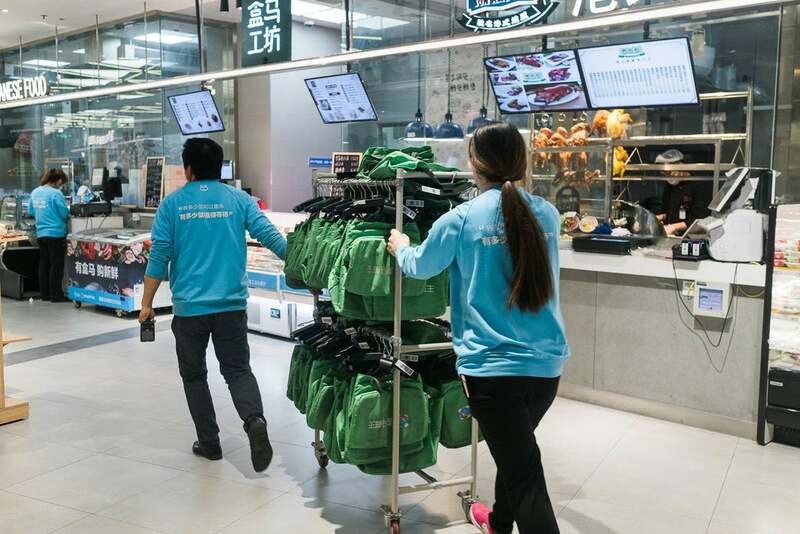 The goal of the store, according to founder Hou Yi, is "to drive offline customers to shop online." 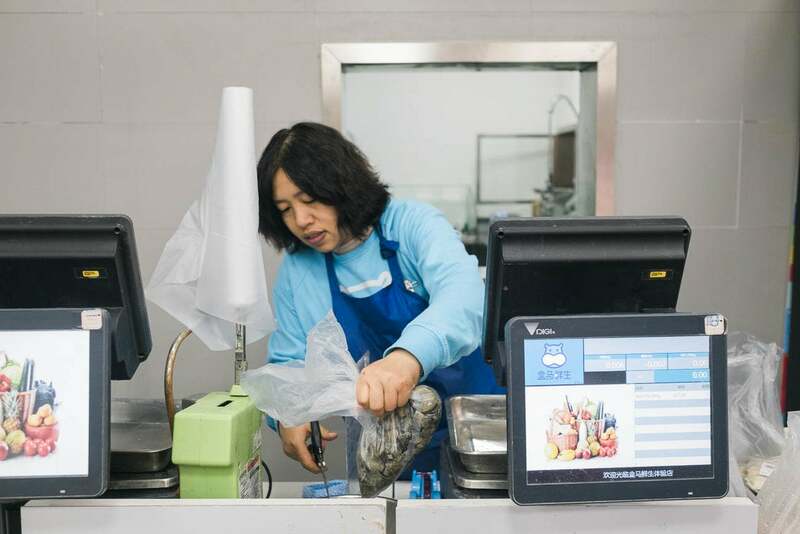 85% of sales in China still happen offline. 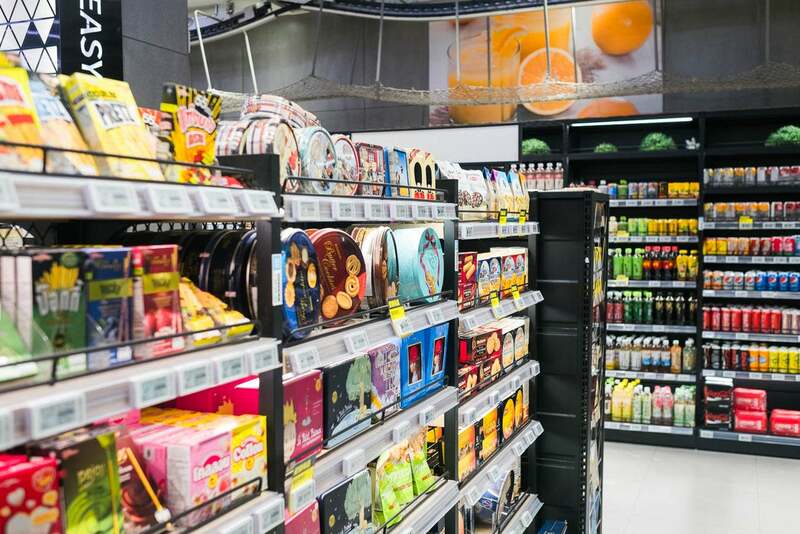 While around 80% of the products are packaged food and about 20% fresh products, the majority of the floor space is dominated by fresh products and in-store dining. 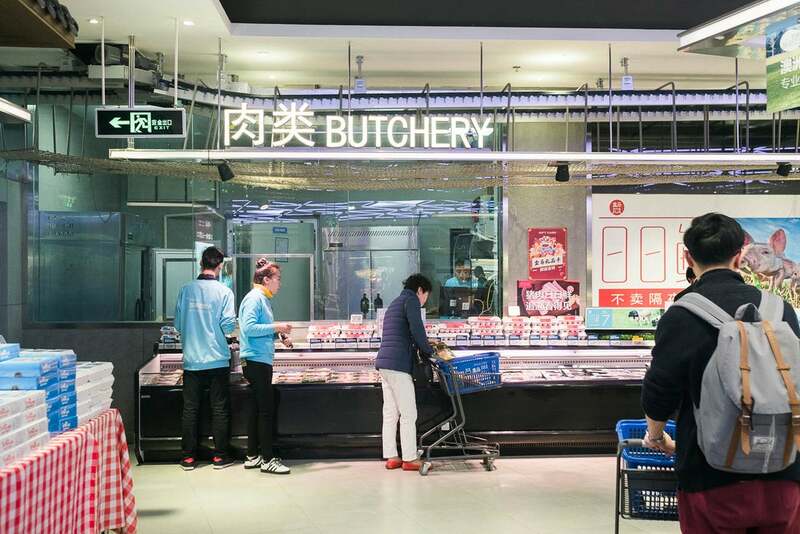 China has had a lot of food safety issues over the last 20 years. 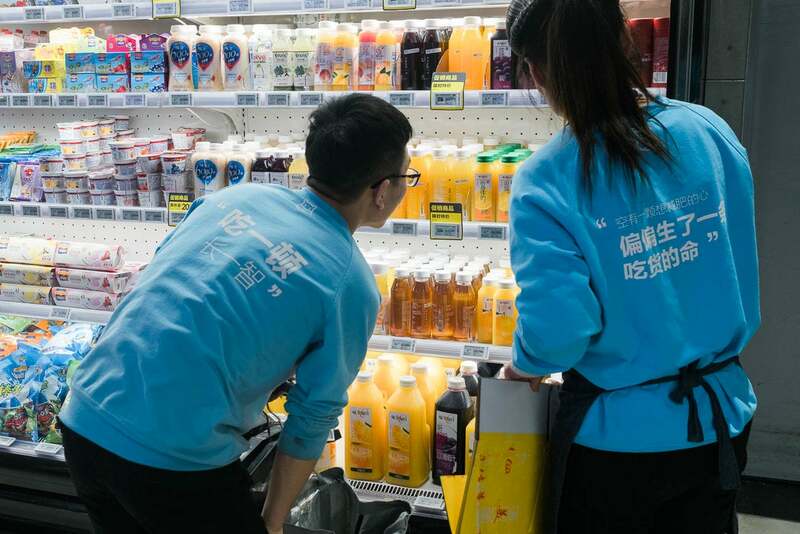 Hema's transparency and guaranteed quality, reinforced by the info on the app, is a huge draw for Chinese consumers who have been burned time and again. Key to changing consumers' mindsets around online purchasing is Hema's ultrafast delivery, which promises grocery deliveries in under 30 minutes for those living within 3 kilometers. Some stores offer 30-minute delivery 24-hours a day. All over the store, you can see Hema employees searching through aisles and selecting products. When I was there, at 2 p.m. on a weekday, there appeared to be as many employees as customers in the store. Around 50% of a Hema store's orders are online delivery. Some stores get up to 70%. Hema's founder is hoping to push that to 80% or 90%. 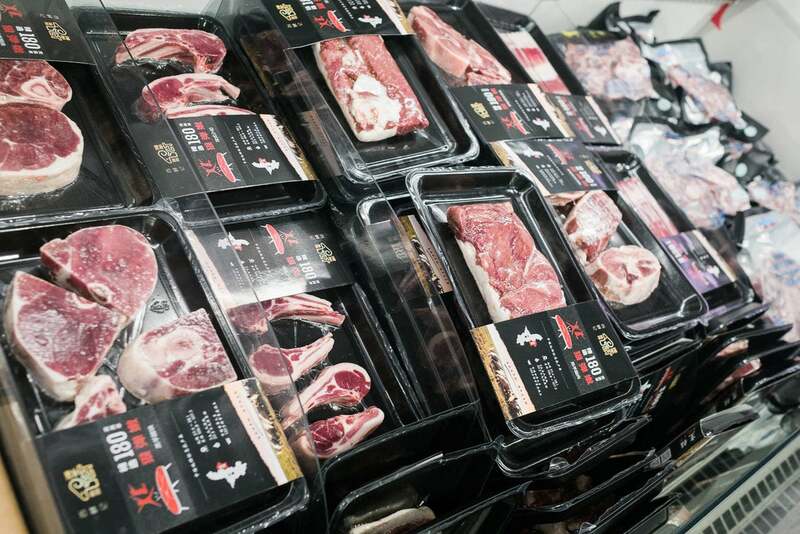 Each Hema employee focuses on a particular section — dairy, meats, produce, etc — so that they know where each product is and can move fast. The bags are color-coded for the section and tagged with a QR code corresponding to the online order. Sometimes you'll see employees working together to find a rare item. Each employee carries a scanner so they can add each item to the order immediately. Once the order is complete, they hook the bag onto a conveyor belt that sends it to a distribution center in back. When you look up, you see tons of bags traveling along these conveyor belts along the ceiling. It's unobtrusive, but feels a bit like being inside a factory. 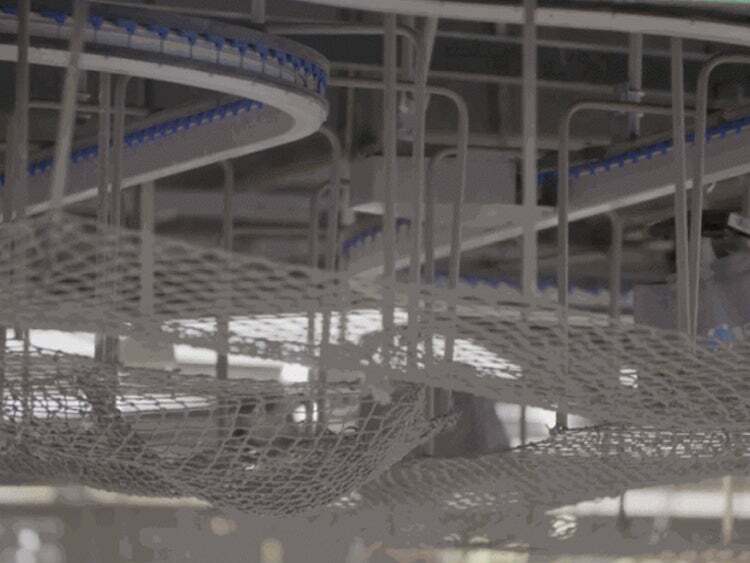 In the back, the bags automatically go into the system where different parts of the order are combined into one bag and sent out for delivery. The entire process is crazy fast — 10 minutes to pick the items, 10 minutes to sort them in the back-end, and 10 minutes for delivery. During my hour or so at the store, I saw more than a few Hema employees sprinting to get orders completed. The ideal scenario for Hema and Alibaba is that a customer comes into the store, buys a single orange on the app, tastes it in the store, and then decides to order a bulk delivery to his or her home for then or later. In the future, the customer then trusts that the oranges at Hema are high quality and doesn't hesitate to order more online. If you come across a fruit, vegetable, or fish that you've never seen before, you can immediately scan the item and learn what it is, nutritional information, and any number of popular recipes for how to cook it. It makes being adventurous in your shopping a lot less scary. Or you can just try one of the products at any number of the testing stations set up around the store. 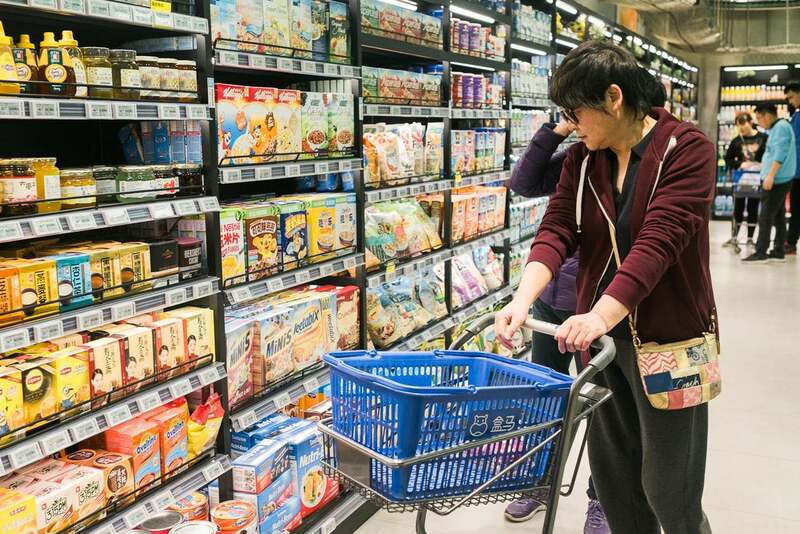 In contrast to most American supermarkets, Hema is about making shopping so convenient that you don't need to buy a lot (like Costco), but you buy often. After about 20 minutes or so, the seafood was ready. And, I have to say, I traveled for a month in China and this still might have been the best seafood I had. It was super fresh, perfectly springy and tender, and cooked in three very different (and complicated) preparations. This is not your average supermarket takeout. While Hema is an innovative concept, many analysts have questioned whether the business will be able to turn a profit. 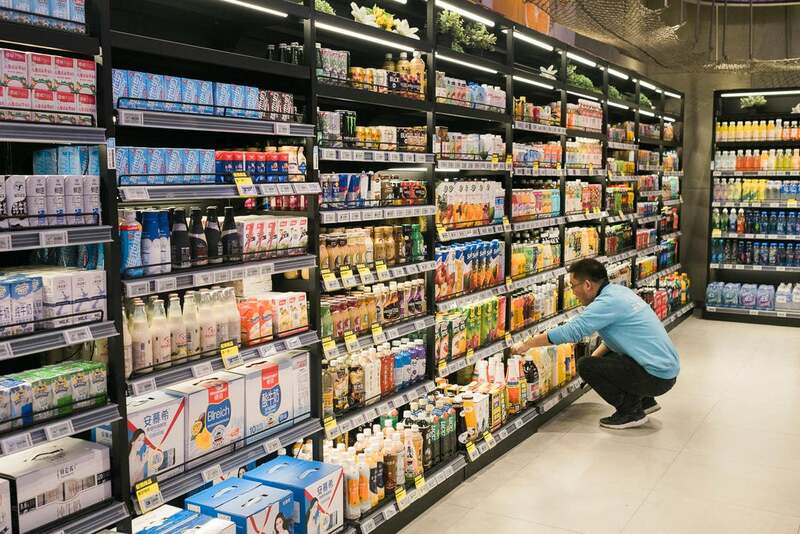 The stores are located in prime locations, which means high operating costs, and don't have enough locations to spread out logistics costs, Bain & Co. partner Jason Ding told Forbes last year. It was time to leave, but not before having a look at checkout. 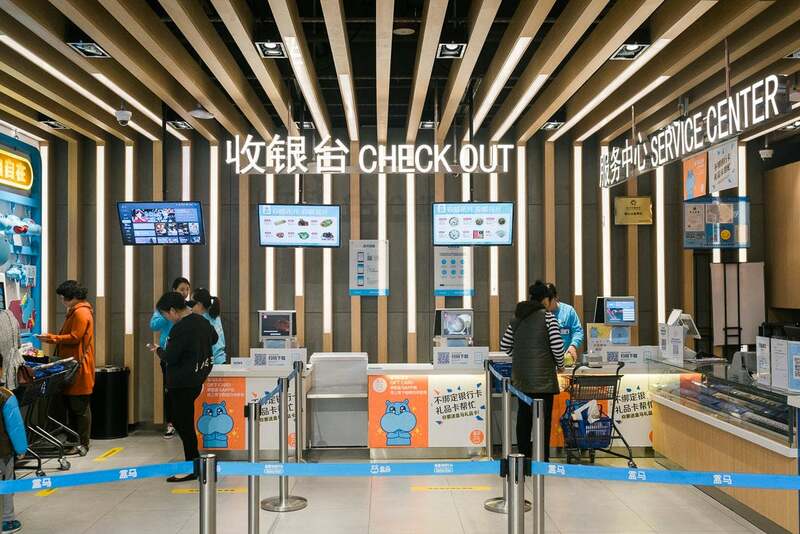 There are no cashiers, but a number of checkout kiosks where you have to pay with Alipay. If you want to pay with cash, you have to go to the service center on the right. Hema and Alibaba really want people to stay in their app. 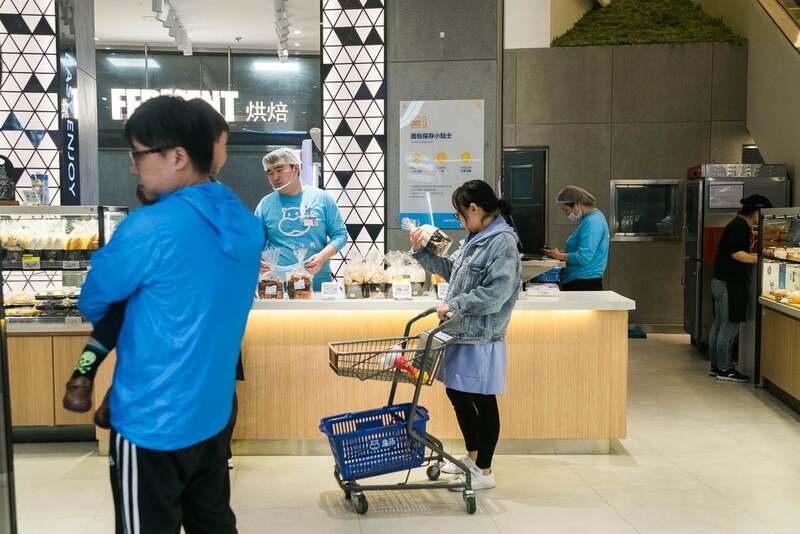 Hema is more or less a "prototype" for how Alibaba envisions retail in the future, according to the company. One can imagine similar principles around convenience, delivery, ease of purchase, and product information in stores ranging from electronics to clothing to home furnishings. In that context, a store becomes the place to convince you to (or dissuade you from) buying one thing or another, rather than another chore to complete. Perhaps one of the coolest —or creepiest, depending on your views — features in the store is the facial recognition payment. 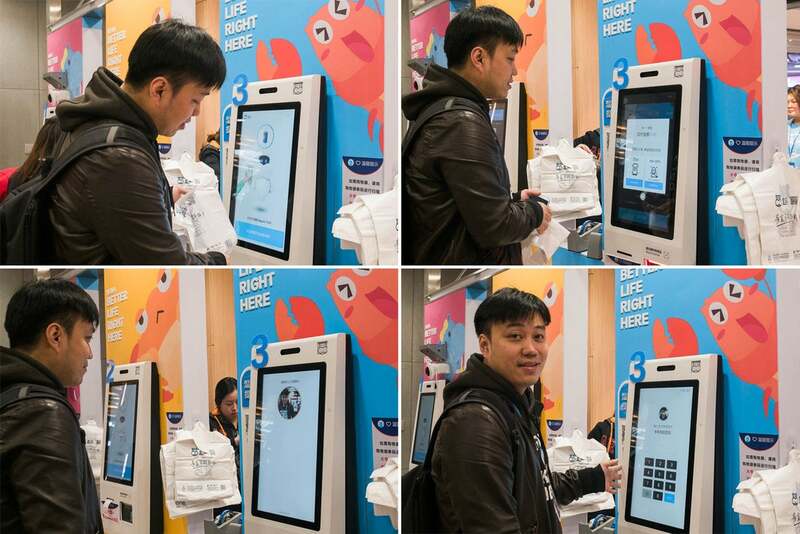 Because sales are linked to Alipay, the checkout can simply scan your face to confirm your purchase. It's near instantaneous. You put in your phone number after as an added layer of security. 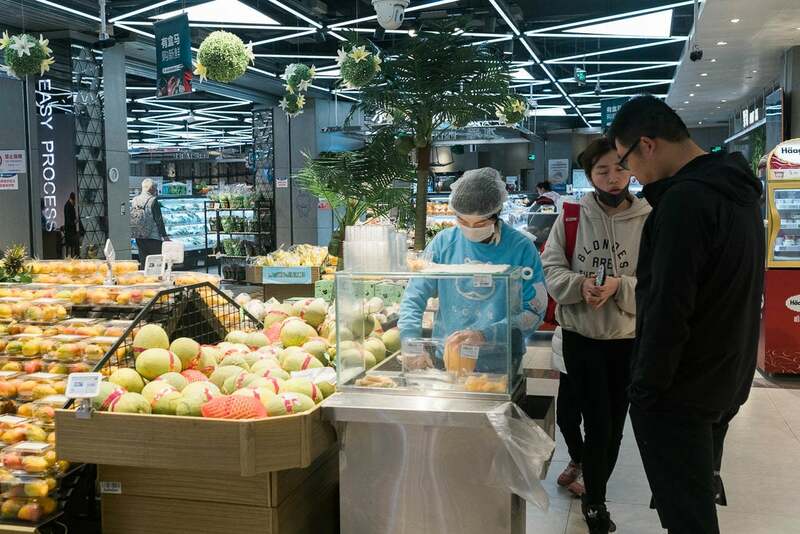 As I walked through the store, all I could think about was what a tech company of Alibaba's size could do if it was handed the keys to an already existing major grocery chain. Which brings us back to Amazon and Whole Foods. 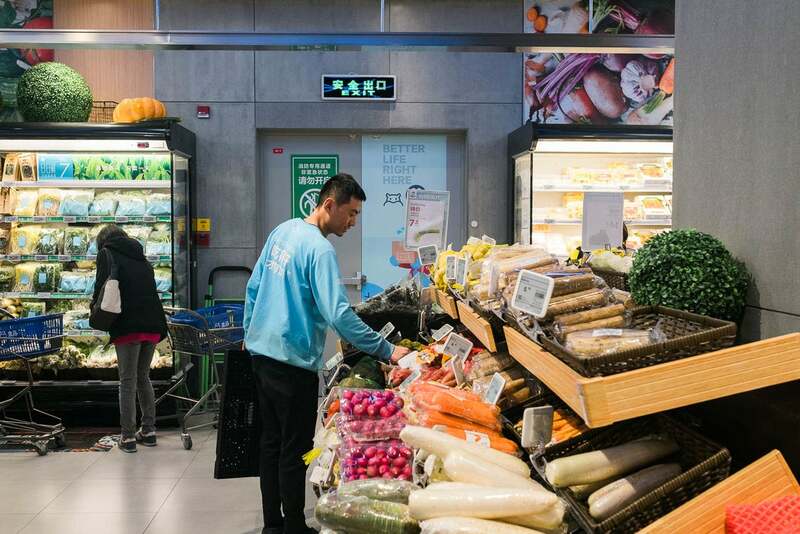 The technological advancements that Alibaba has brought to Hema — ease of in-app ordering, ultra-fast delivery, price-matching, facial recognition payment, tailored stocking of shelves based on spending habits, etc — could easily be brought from Amazon to Whole Foods. And, in my opinion, given Amazon's obsession with efficiency, it's a matter of when, not if.